If you were looking to get HTC Sense like weather app for your iPhone and iPod touch, then look no further than World Weather app by TAPTAP Mobile. 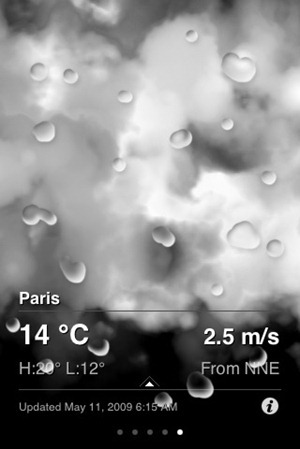 This app has by far the best animation and graphics for a weather app, and it works very smoothly on iPhone 3GS. The UI totally sets it apart from all the weather apps available on the iPhone. Here is the official list of features of World Weather app. After trying out several weather apps, this one has to go down as my favorite. The only thing which this app lacks is the support for GPS. It would have been nice if the app automatically detected the city you were in, like it does in HTC HD2 without having to manually search for it. Hopefully the developers of the app will add this feature in the upcoming update. World Weather app is available on the App Store for just $0.99, and can be downloaded for iPhone and iPod touch from the link given below. Yah…attractive app…but once again…it's an APP, not a WIDGET. I'd much rather have a beaaaautiful android widget that displays location, time, weather, temp right from a COMPLETELY customizable home screen, rather than having to open an app to see it. Kind of a lame solution to HTC sense's success. Casey you can get that type of app if you jailbreak your phone. I have mine set up much like an HTC phone and it works great.